Every so often a Blast From the Past thought occurs to me, usually not one I'd write about here, but this one was about food, so ... I was thinking, I should make stuffed bell peppers ... it's probably been a hundred years since I made them, but now I really want one. 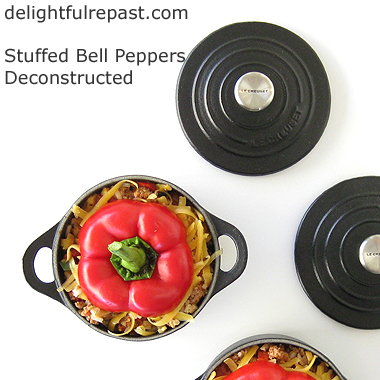 Then I saw a recipe for slow cooker stuffed bell peppers, so I pondered that for a bit. Then I got really clever and asked myself why, if I like them so much, I haven't made them in a hundred years. It wasn't because they were baked in the oven, so the slow cooker wouldn't help. The reason I haven't made them, I decided, is that I really don't like all that bell pepper. A big hunk of bell pepper really isn't that appealing. That's when I decided to get out my old recipe and deconstruct it. 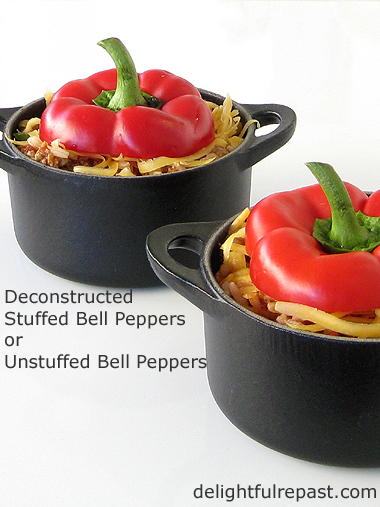 Of course, that means it isn't as "cute" as tidy little individual stuffed peppers. But, to tell you the truth, it's not always about making it "cute" for me; sometimes it's just about getting something on the table! Am I right?! 1 If you don't already have cooked rice on hand, cook enough rice to make 2 cups. 2 In large skillet over medium heat, cook onion in oil until softened, about 5 minutes. Add ground meat and cook, breaking it into small pieces with spoon, until well browned. During cooking, add ground chiles, salt, pepper, marjoram and Worcestershire sauce. 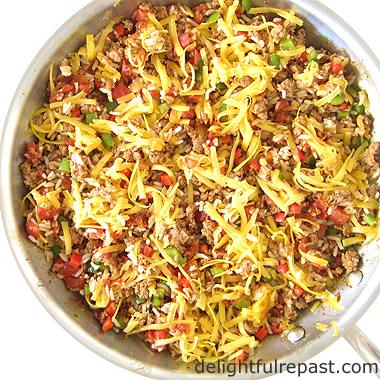 3 Add the diced bell peppers to the well browned ground meat; cook until softened, about 5 minutes. Stir in tomatoes and rice. Taste and adjust seasoning. Sprinkle with cheese. Garnish with cilantro. 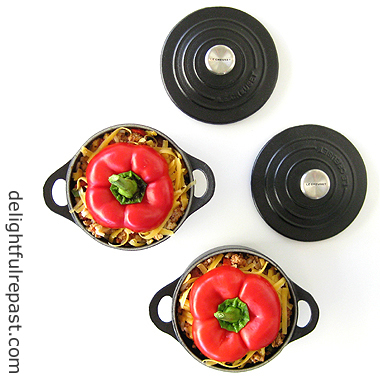 4 Serve as is or in cute little individual pots (like my Le Creuset Cast Iron Mini Cocottes) or as burrito filling for flour tortillas. If you do the little pots, you can put them on quarter sheet pan, top with a little extra cheese, and pop them into a 350F/180C/Gas4 oven for maybe 20 minutes or so for that real Stuffed Bell Peppers effect. 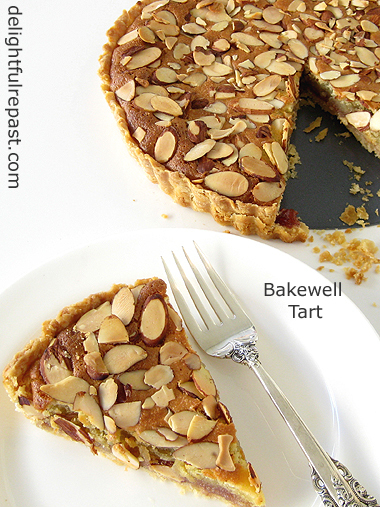 Classic Bakewell Tart was something I hadn't made, or even thought about, in years. Then I was watching the Great British Bake Off a while back and was stunned to see it being made "improperly!" 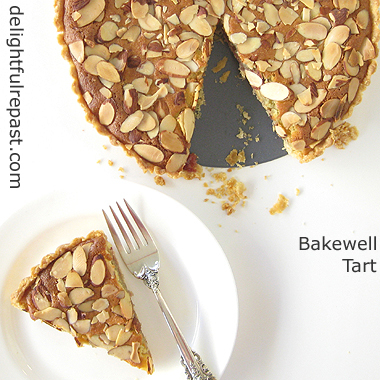 I'm not even going to go into all that Bakewell Tart versus Bakewell Pudding thing. Some people insist they are the same thing; others ... Well, I make mine in a tart tin; so I'm calling it a tart. Instead of putting sliced almonds (or, as they say in the UK, flaked almonds) on top, she put ICING (I know that's yelling, I'm sorry) on top! I was shocked, but for all I know, icing on the top might be more "authentic" than the almonds. The real reason I make it the way I do is not because it is the "right" way, but because it is the less sweet way. You know from my post Sugar: Toxin or Treat? that I like to cut back on the sugar wherever possible. So here you go, my version, right or wrong. Do leave a comment and let me know how strongly or how little you care about this important issue! This is a perfect teatime treat, and wouldn't it make a nice change on your autumn and winter celebration tables! Note: Or do the pastry I always use for my Classic Lemon Tart (I leave out the sugar, though, for this tart). OR if you're gluten-free, do my Gluten-Free Pie Crust. 1 In medium mixing bowl, whisk together flour and salt. With your fingertips, rub in the cold shredded butter to a crumb texture with some bigger hunks of butter remaining. Sprinkle on water and mix in, adding more, if needed, a teaspoon at a time. Flatten slightly into a 4- to 6-inch round disc, wrap and refrigerate for 30 minutes. 2 Lightly butter a 9-inch/23cm tart tin (1-inch deep) and set it on a baking sheet. On lightly floured 12-inch (30cm) square of aluminum foil, roll out the pastry to a 12-inch circle. Transfer dough to tart tin, pressing dough (but not stretching it) to fit the tin. Save the foil; you're not done with it. With scissors or knife, trim the overhang to 1/2 inch all around. Fold it in and press it to the sides to form a thicker side crust. Trim the edges* by rolling the rolling pin over the top. Press the pastry into the flutes so that it rises a bit above the edge (in case of shrinkage). Pop it in the freezer for 15 minutes while you preheat the oven to 375F/190C/Gas5. Note: There's no pastry to waste here, so I just press my edge trimmings into the bottom or on any "thin" spots. 3 Cover chilled pastry with reserved piece of foil, clean side up, pressing it to fit well. Spread 2 cups of ceramic pie weights (that's two packages of Mrs. Anderson's ceramic pie weights), also called ceramic baking beans in the UK, over the foil. Bake for 15 minutes. Remove foil and weights; continue baking for 10 minutes, until lightly browned to a pale golden. Let stand to cool a bit. 4 While pastry is cooling, make the filling. In 2-quart saucepan over medium heat, melt the butter. Take off heat, and stir in the sugar, then the ground almonds, egg, almond extract and salt until well combined. 5 Spread the jam over the bottom of the prebaked pastry shell. Pour in the frangipane. Top with sliced almonds. Bake (with tart tin on baking sheet) for about 30 minutes. Cool to room temperature, about 1 hour. Remove from tin. Serve at room temperature or chilled. Dust with sifted powdered sugar just before serving. 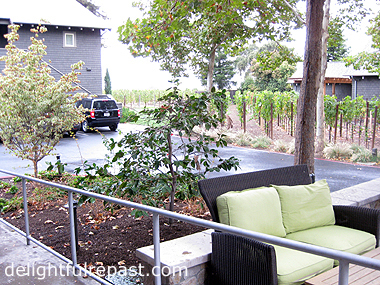 Once is never enough with a place like Napa Valley! It had been three years since our last visit, so we were overdue. 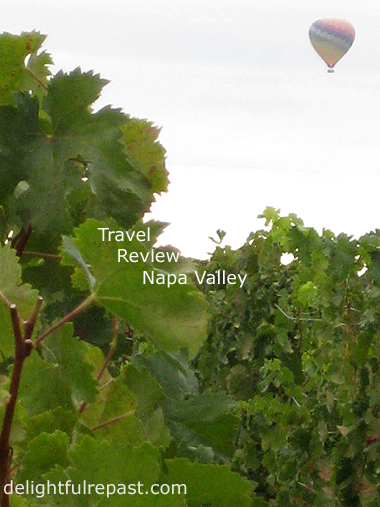 Napa Valley is easy to get to from three major airports. 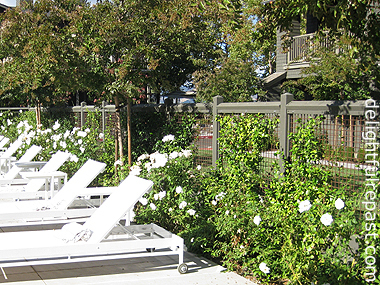 San Francisco, Oakland and Sacramento international airports are all about an hour's drive from Napa. If you prefer not to rent a car, there are other ways to get to Napa from the airports; such as, Napa Valley Tours and Transportation or Evans Transportation. I have no experience with either, so this is just information rather than a recommendation. The term "luxury travel" makes me a little uncomfortable, and I don't like to come across as some kind of snob, but I have to admit I'm one of those people who would really rather stay home than stay in accommodations that are less than fabulous. I never really relax and enjoy a vacation unless I'm staying in a really nice hotel with really good food nearby! I've always admired the kind of people who can fly for hours scrunched up in coach on bargain flights, throw a sleeping bag on a friend's floor or be perfectly content in less than stellar surroundings and just have an adventure! But I'm not one of them, and I've come to accept it! 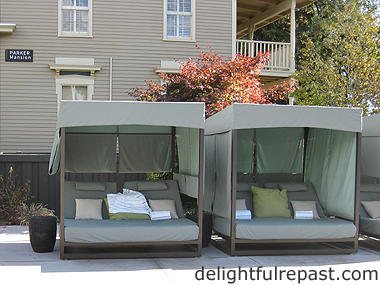 So when I had the opportunity to stay at SENZA Hotel in Napa, I was happy indeed. A boutique hotel with 41 guest rooms divided among five buildings set on two acres of gorgeous gardens, SENZA has the understated luxury and relaxed vibe that I prefer. I fear my enthusiasm for this place is going to sound "advertorial!" But if you've been reading Delightful Repast for any length of time, you know that even when I've received something (whether an appliance, product or a hosted stay) I tell you what I really think. 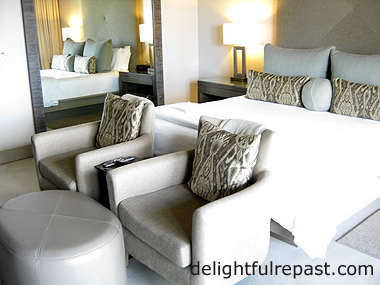 The design of the guest rooms is far more contemporary and modern than my own style, and yet I loved it and felt very much "at home" with it. 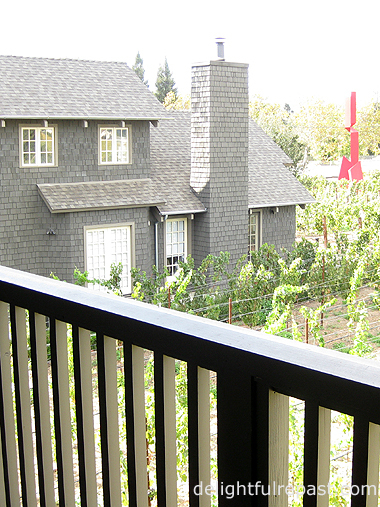 Our Vineyard View Suite met my basic requirements for a hotel room -- spacious, clean, quiet, well appointed, pleasant view -- and then kicked it up several notches! One might expect a guest room with these clean lines, hard surfaces and cool neutrals to feel "cold" or stark; instead, it feels energizing and relaxing, warm and inviting. With lots of natural light and lovely views beyond the comfortable balcony, it had a real "indoor/outdoor" feel. But back to the hotel! The bathroom? Fabulous! Though I can live without the dual sinks (hey, we haven't kept the romance alive all these years by brushing and flossing together! ), I always appreciate ample counter space. The enormous shower with two shower heads, deep soaking tub and my personal favorite, heated floors, take the bathroom right over the top! Mr Delightful was dazzled by the huge mirror with its built-in surrounding light. Other things that made our stay perfect: a wonderful wine and cheese hour in the evening, lavish continental breakfast buffet in the morning, pool with cabanas for shade-loving palefaces like me and a really powerful hot tub. I never see a hotel's parking situation mentioned in reviews, so maybe I'm the only person who cares about it; but it's something I always call ahead about and have definite opinions about. SENZA has a perfect parking situation. Spaces scattered about so that guests can park near their room, but unobtrusive, hardly noticeable amidst the lush landscaping. We were invited to HALL Winery (St Helena) for a special HALLmark Tour & Tasting with wine educator Chris Burton, who amazed us with his knowledge and enthusiasm. Chris gave us a tour of the art and architecture that are as much a part of the winery as the vines and wines! 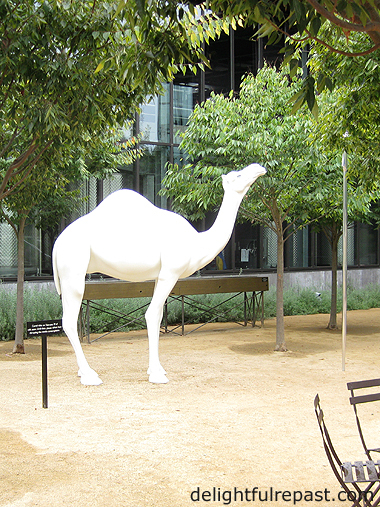 One of our favorite pieces was the life-sized "Camel (Albino) Contemplating Needle." 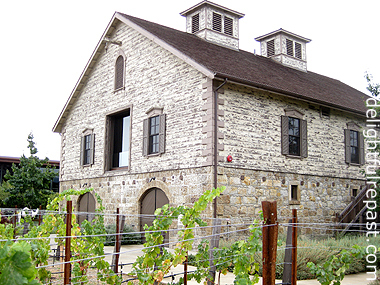 The fully restored original 1885 Bergfeld winery stone building is the centerpiece of the new winery complex that incorporates modern architecture, art and equipment. The owners have a commitment to sustainability -- organic certification, green buildings, solar power, recycled water, bio-diesel in their farming equipment -- as well as to making award-winning wines. The HALLmark Tour concluded with a seated tasting in one of the salons where we enjoyed a selection of five award-winning wines. It was only when I had transferred my photos from camera to computer that I realized I didn't take a single photo of the tasting! 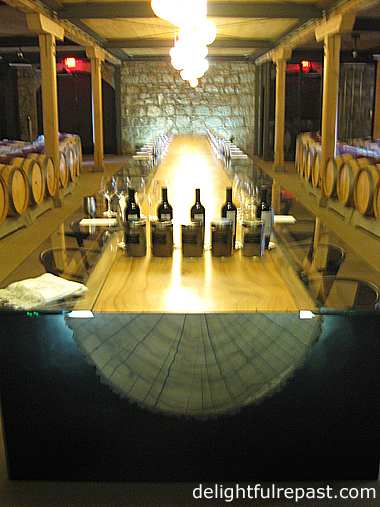 I was so focused on the excellent wines that I forgot I was a blogger! Disclosure: Though our hotel stay and winery visit were hosted, all opinions are, as always, well and truly my own. Autumn is here, and that means pumpkin and spices. Autumn and spicy pumpkin desserts are a combination so classic as to be a cliche. Try as I might, though, I can't resist the lure of spicy aromas wafting around the kitchen on a brisk autumn day. I don't care for most pumpkin bundt cake recipes, though, because most have far too much sugar for my taste. My recipe, with 4 1/2 teaspoons of sugar per serving, has a lot less than most (Read why: Sugar - Toxin or Treat?). You can frost it if you like, but I prefer just a light dusting of powdered sugar for looks. And maybe a spoonful of unsweetened or lightly sweetened organic whipped cream. I developed this recipe for texture as well as a lower sugar level. I don't like a super dense Bundt cake or one that has a dense, gummy streak. 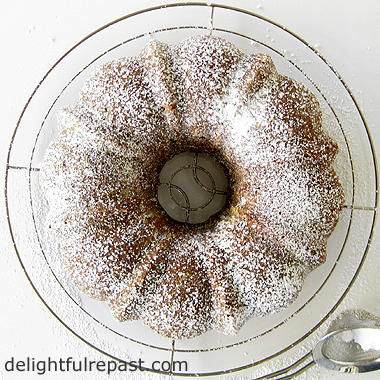 This is a Bundt cake that is quite light in texture with plenty of spices to make you not even notice there's less sugar than you might be accustomed to. And you can make it ahead; it's even better the next day and keeps well for even longer. Another thing I like about this recipe is that it uses the whole can of pumpkin so you don't have to figure out what to do with leftover pumpkin. 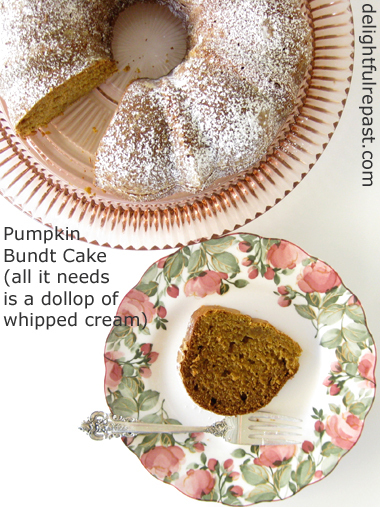 You'll find several more pumpkin recipes under Desserts on my Recipes index page. Here are just two of them: Pumpkin Swirl Cheesecake and Pumpkin Pie Ice Cream. Are you a pumpkin fan? 1 Using room temperature butter and a pastry brush, thoroughly grease and then flour a 10-inch 12-cup Bundt pan (fluted tube pan). Preheat oven to 350F/180C/Gas4. 2 In medium bowl, whisk together flour, baking soda, salt and spices. In 4-cup glass measure, stir together pumpkin, milk and vanilla extract. 3 In large mixing bowl, with electric mixer, cream butter and sugar slowly for 3 minutes, until light and fluffy. Beat in eggs one at a time, mixing for 20 seconds after each addition. 4 Add flour mixture and pumpkin mixture alternately (beginning and ending with flour) to beaten mixture, beating on low speed after each addition. Scrape batter into prepared pan, leveling top with a spatula. Bake for about 55 minutes, until toothpick inserted near center comes out clean. Cool in pan on wire rack for 10 minutes, then turn out and continue cooling on wire rack. Dust with powdered sugar.